Andrew Thomas readies for a snap during WIAA Level 3 playoffs against Kimberly. Bay Port fell to Kimberly 38-20. Photo by Laura Plummer. Andrew Thomas started the football season thinking his main role for the Pirates would be place holding on extra points and field goals. But during week nine of FRCC action Bay Port senior, Jake Plummer, went down hard after a hit from an opponent on Green Bay Preble. Plummer had led the Pirates to eight consecutive wins during the season prior to this.Thomas had to take the game into his own hands. He led the Pirates to a 48-6 win over Preble. The Monday after the game, Plummer was diagnosed with a separated shoulder, ending his season. Thomas got the call to start against De Pere during Level One of the WIAA Division One playoffs. Knowing what the game would be like on Friday, he prepared hard all week for the playoff game. Thomas led the Pirates to a 49-0 win over FRCC rival the De Pere Redbirds, throwing four completions for 102 yards, two touchdowns, along with rushing for 19 yards including two touchdowns. “I was nervous coming into the game without a start, but I had a lot of reps and the receivers and lineman accepted me well,” the junior quarterback added. Thomas was protected by the Bay Port offensive line, led by FRCC Lineman of the Year, Braden Doyle. The line had to help out a little extra because not only was the Bay Port starting quarterback injured, but running back, Isaiah Gash, went down in the last game of the regular season with a twisted ankle. Bay Port junior Carter Zawlocki took the place of Gash, in his first varsity start and level one playoff appearance. Zawlocki rushed for 207 yards on 24 touches, including two touchdowns. 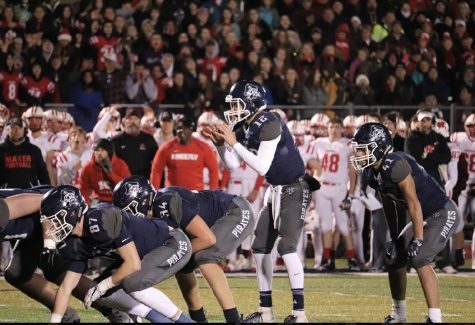 Bay Port went on to win in Level Two playoff action against Appleton North, 31-21. Isaiah Gash was back in the lineup and ran for 169 yards, with two touchdowns. Andrew Thomas threw for 41 yards and had 151 yards rushing with two touchdowns. The Pirates faced Kimberly in Level Three but came up short, 38-20, in a tough loss. Thomas threw for 111 yards and rushed for 76 yards on 16 attempts. “The game against Kimberly is something I’ll never forget. Thanks to all the fans the game had an incredible atmosphere,” said Thomas after the season ended. Thomas might not have thought at the beginning of the season that he was going to be in that position, but he accepted the task, and gave it his all in the 2018 playoffs. He is very optimistic about next season and is confident in the team reaching their goals.